The wildfires sweeping across Southern California this past week threatened some of the priciest real estate in the country, and they’re not done yet. The Woolsey fire in Los Angeles and Ventura counties, which began Thursday, has left two dead, destroyed at least 435 structures and was only 30 percent contained as of late Monday. 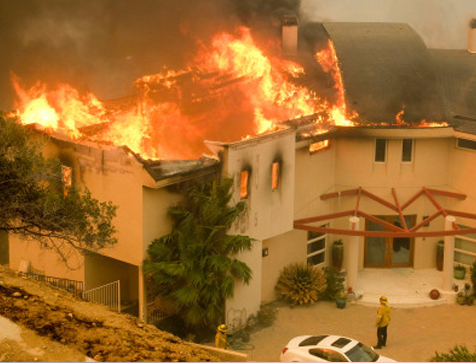 Because of the values of the houses and property involved, it could be among the costliest blazes ever for home insurers. Homes threatened by the wildfire sweeping across Malibu, Calabasas and other high-end Southern California locales have a median value of $1.1 million, according to Zillow Group Inc. The communities “are among the most expensive residential areas that have been affected by wildfire in recent memory,” said Matt Kreamer, a spokesman for the real estate data company. The Woolsey Fire threatens 57,000 structures, according to the California Department of Forestry and Fire Protection, known as Cal Fire. An estimate by CoreLogic Inc. put the price tag at $11 billion to rebuild about 17,000 homes at risk from the fire, although it didn’t expect all of those properties to be destroyed. Will this rebuild be anything different than how we've watched Santa Rosa continue to reconstruct now with the same unprotected raw lumber? If our government funds are involved, then it should be mandated that all rebuilds must embrace and use the newest best practices for defending every rebuilt structure, to ensure that it has the very best fire protection available to the US Building Industry.